As the season is winding down, it’s time to review my progress and define a plan for the winter. I decided to begin to use the printed form that I developed to monitor the status of each shoe thrown. In addition, I critiqued my last tournament. A number of issues jumped to the forefront. So, I thought I would tackle each one, in no particular order. In my first match on Saturday I decided to use the Snyder EZ Flips as I had warmed up well with them before the matches began. I found the driest pits I could, for practice. When I flip with caulks up, my thumb rests on the angle of the caulk. This permits a 40 degree droop of the shoe at release, which I need in order to get the shoe flat and open to the stake. This requires a pretty sturdy pinch grip. Unfortunately, the majority of the pits were still wet from previous rains. In my first match I was having trouble maintaining my grip throughout the backswing and release due to wet slippery shoes and glove. Since Monday, I have turned the shoe over, i.e., Caulks Down, which permits me to have a much firmer hold on the shoe throughout the swing. See Part 7 for Grip with Caulks Up and Grip with Caulks Down. The Snyder EZ Flip shoe has a perfectly designed caulk for my short fingers. My index finger locks into the hook and my middle finger locks into the back of the caulk. This however, created an additional problem, no droop. The shoe was now only rotating 540 degrees instead of 580, thus, the shoe was over-rotating. I decided to experiment a little and ended up changing my stance. My normal stance had me standing on the approach with my right foot in the right hand corner of the approach at 27 feet. My left foot was behind the right and raised to permit a slight tilt to put me closer to the line of flight. However, I had to guard against the tendancy to lose my balance on the forward swing. I decided to switch my stance to the left foot forward, which allowed me to naturally brace myself against the forward swing. This puts me into a much more balanced stance and is in keeping with martial arts positions (I took Aikido classes when younger.) Normally, this stance places the left foot at 35 degrees and the right foot at 10 degrees. I kept experimenting until I ended up with the stance as pictured. With right foot forward the shoe was dangling 9 inches from the foul line when my arm was hanging straight down. With the new stance the shoe is 18 inches behind the foul line. The paragraph, “Tightened Line of Flight”, describes an added and welcomed bonus. The photo below shows my new stance. I know this looks odd, but, it works for me. It felt odd at first, however, that is precisely why it works. It significantly reduced any sloppiness in the swing. Here is a little test that was revealing to me, and may explain why this swing alignment seems to work. If you stand facing forward and swing both arms up in front of you and touch the tips of your index fingers together, you will notice that your arms seem to naturally swing across in front of you and come together in the center of your chest. If you slowly rotate your body to the right (clockwise), continuing to swing to the front, you will reach a point where the arm would be swinging down the line of flight. As a matter of fact, if you simply face forward and raise your arms up and touch fingers, you can hold that position as you slowly rotate you body right. When your right arm points down the line of flight, stop. Check your feet. Now, next time you step on the approach place your feet into that final position. I think you’ll find it is very much like the photo of my feet below. Prior to my stance change, I recorded the status of every shoe thrown. My ringer average with both sets of Six Shooters was about 50%. However, my misses tended to be left with the medium weighted shoes and right with the heavier shoes. Secondly, my bounceback and bounceoff stat indicated 0 on the medium weighted shoes and 6 of the heavier shoes per 26 shoes. When I switched my stance and grip and began using the EZ Flips, my recorded ringer average jumped to 70%. Every shoe that I threw after the stance change was either a ringer or hit the stake a glancing blow. My only explanation for this is that this new stance seems to change the pendulum to act more like the pendulum on a grandfather clock instead of free swinging like the Foucault Pendulum. The Foucault Pendulum, was on display at the History Museum at the Smithsonian Institution to show the effect of the earth’s rotation. However, the pendulum was free to move in any direction, and did. Normally, the shoulder acts more like the Foucault Pendulum over the locked hub of the grandfather clock. I have also discovered that I am much more accurate if I rehearse the swing prior to release. See paragraph “Pre-Release Rehearsal,” below. Perhaps if I were a kinesiologist I could explain why the backswing and forward swing seems to stay on line more accurately with this adjusted stance. IMPORTANT — After you take your stance, rotate your upper body as far to the left as possible. Perform your Pre-Release Rehearsal and concentrate on passing the shoe close to the right leg on the way back. In this swing it is imperative that only the arm swings and there is no body movement of any kind. I had noticed during the last tournament that when I brought the shoe up to eye level, prior to my backswing and release, the shoe was quivering. It was either from nerves or tension. Either way, it was not a visual I wanted everytime I went to drop the shoe into the backswing. With my new stance, I’ve also changed my Pre-Release Rehearsal. I start the final forward swing by swinging the shoe up to eye level with the left edge of the shoe passing up the stake to a point several inches above the top of the stake. I don’t allow it to hover, but, immediately drop it into the backswing. This permits me to monitor my swing speed and eliminate the tension caused by holding the shoe in a stationary position. I also try to pass the shoe fairly close to my right leg since the center of gravity of the shoe passes over the line of flight when close to my right leg. What is very interesting is that when the left edge of the shoe is too far to the left, the shoe will go left and vice versa to the right. I have decided that it would be better if I didn’t release the shoe on the forward swing when it is off line, but, go through another pre-release upswing until the alignment to the stake was correct. I’m finding that easier said, then done. I have been reluctant to put this title on this section. It has only been a week since I made the grip, stance and pre-swing adjustment. So, I’ve left a little fudge factor (May Be Over) in the title. My personal test has always been to see how long it takes when I first start, to get my release, distance and direction correct. So, I deliberately stop after about 1/2 hour, and come back later and practice again. So far I’ve not gone beyond 4 shoes before my first ringer. Sometimes it’s the first shoe. An added bonus is that my left hip, the reason for my switch to 30 feet, does not bother me, even after many hours of practice. I still throw from 40 feet and stride forward during my Monday night league. After three games my hip is killing me. With the permission of the league, I should be able to move up to 30 feet, next year. There are several areas that I wish to investigate when time and funds permit. I want to know when and why a shoe bounces back? Does a wobbling shoe have a better chance of a ringer? Should I sacrifice a little width of the shoe when it arrives at the stake, to reduce bounceback? What is the best angle of a dropping shoe? Is a concave ringer break better than a convex one? I want to see if I can modify a one-time use camera to flash when I release the shoe? I have my eye on a digital camera that has a 1,200 frame per second burst speed to capture the impact of the shoe at the stake. So, you can see that my search continues and the coming winter gives me lots of time to experiment. I was looking forward to this tournament after my second place finish in the Maryland State Tournament. Boss Hoss Motorocycles sponsored this tournament in Frederick, Maryland. I arrived at the tournament about 8:00 a.m. and noticed the tournament volunteers busy setting up. The pits were a bit wet from previous rains and two volunteers were busy vacuuming out the excess water, while others were readying the bathrooms, bringing out chairs, scoreboards, paint racks, horseshoe table, etc. The local club volunteers do a fantastic job for each tournament. One of the club members was busy cooking sausage, egg and cheese sandwiches free for breakfast, an unexpected bonus. Classes were assigned based on ringer average and scorecards distributed. The tournament began with a Pledge to the Flag and Tribute to our Troops. I was to pitch in Class B with 5 other pitchers. This was a cancellation tournament with 40 points or 50 shoes. I had warmed up with both Snyder EZ Flips and Six Shooters, both shoes that worked well with my flip. I decided on the EZ Flips for the first match. I was holding my own until my competitor announced I was ahead 35 to 32 with 4 shoes left. I choked, I didn’t score another point and lost 35 to 38 with 14 ringers, 3 doubles for 50 shoes, a 28% ringer average. I decided to switch to my Six Shooters. A good choice. I won the second match 40 to 7 with 15 ringers, 3 doubles for 28 shoes, a 53.6% average. Won the third, 41 to 21 with 18 ringers, 4 doubles for 40 shoes, a 45% average. The fourth match was against the #1 seed. I was winning easily with 8 shoes left, 37 to 27, when my competitor announced the score. Again, I choked and didn’t score another point with my remaining 8 shoes, 37 to 43 for 50 shoes, 20 ringers, 6 doubles and a 40% ringer average. I won my last match 43 to 1, with 14 ringers, 4 doubles in 24 shoes, a 58.3% ringer average. My final average with my Six Shooters was 50.7%, pretty respectable I thought. I finished third and received my entry money back. I was happy that I had increased my average by 20% for the last 4 matches, but, disappointed that I had allowed myself to lose the two other matches when I tried to win the match instead of continuing with what had been working. A valuable lesson learned. The season is winding down and my goal of a 50% ringer average is in sight. There are two more sanctioned tournaments remaining. I have developed a printed form that I’ve begun to use that records the results of every shoe thrown. It keeps track of shoe type, ringers, bouncebacks, bounceoffs, location of misses (left, right, short, long) and whether shoe was flipping properly. This should provide the information needed to work on direction, distance and flip. Unless I loosen the grip on my shoe or try to add a little added flip, my release is working well. I use the form below as follows. First I mark the shoe(s) that I am throwing under “Type.” If the shoe is a ringer, I circle the “O”. If the shoe is a ringer and bounces back, I circle the “BB.” If the shoe is a ringer and bounces off, I circle the “BO.” If the shoe is open when it arrives at the stake, but is not a ringer, I circle the “U” that corresponds to where it lands. If the shoe is not open when it arrives, I circle the “WF,” wrong flight. I keep score and mark anything that is pertinent in the “Comments” column. At the end of 50 shoes (normal tournament limit), I analyze the results for tendancies. Am I getting too many bouncebacks, or bounceoffs? Perhaps I’m missing left or right, or, perhaps too long or short? I am hoping that charting my practice, I can determine what I might need to change. The results might indicate that I need to change my grip slightly to reduce bouncebacks, or perhaps changing the height of flight, etc. Hopefully, it’s worth the effort. For practice this winter, I have decided to purchase a 2-1/2 pound cannonball sinker mold and cast a number of sinkers for indoor practice purposes. Since I have the plot of the location of my shoe in flight by incremental height and incremental distance, I can set up a target to throw to, at the precise location of some point in flight. For instance, I can select a practical height, say, 4 feet and find where in the climb of the shoe, it reaches 4 feet. I have a couple of ideas of what the target will be to absorb the impact and muffle the sound. I am also creating a table of calculations of the speed of the forward arm swing to go from the start of the forward swing to release point. For example, if I wanted to know the time it would take to reach the initial velocity speed when the shoe was released, I would be be able to calculate the speed of my arm swing from the beginning of my forward swing to release. I would do the following…check the table for 25.5 foot release for 6.8 foot highpoint. The initial velocity is 27.37 feet per second. My forward swing length is 4.5 feet. Using these figures, the formula indicates that you must go from 0 to 27.37 feet per second in .3288 seconds or roughly 1/3rd (.3288) of a second. If I were using a metronome I could set the beats per minute to 180 (i.e., 60 beats per minute is 1 beat per second, 1/3rd is 3 x 60 or 180). If I really find the need to have a backswing beat and a different forward swing beat, I can certainly generate an audio file with the proper two distinct beat times and play them back in my headset. I and other musicians use this technique when practicing the bass guitar or drums. 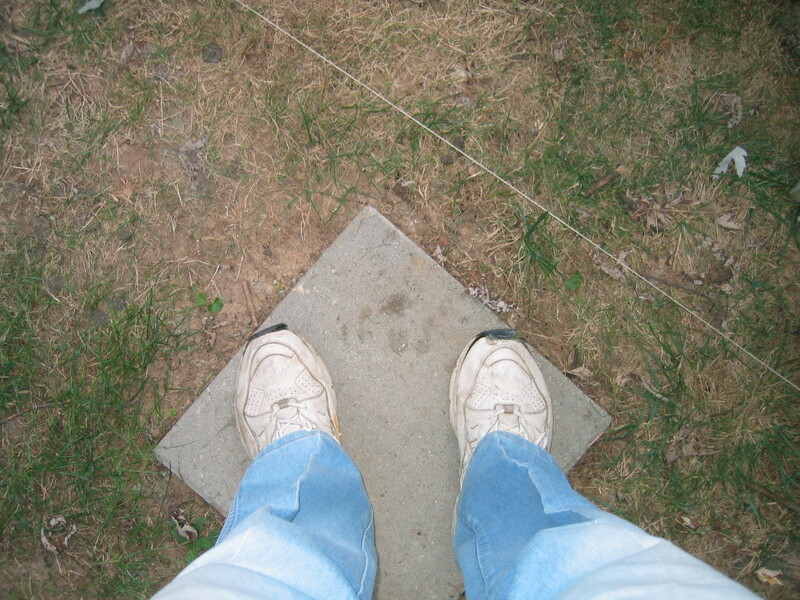 When I first started pitching horseshoes, I wanted to put some sort of reference at the highpoint of my shoe flight. Unfortunately, the only information I was able to find was a recommendation to throw the shoe approximately 2 feet above your height. For me, about 8 feet. The location of the reference point was declared to be at about 2/3 of the distance to the stake. This proved to be incorrect. The actual highpoint downrange never reaches halfway. The table below shows the downrange location for any selected highpoint from 4 feet to 14 feet. The table is based on a calculation of releasing the shoe 1.5 feet from the 30 foot foul line and 3 feet from the ground. My personal highpoint is actually at 6.75 feet (6.8 for the plot values in 1/100th of a second increments). The plot at the top of this page was calculated in 1/40th second increments. To provide more accurate results, I changed the plot by increasing the values to 1/100th of a second increments. I used the frame mentioned earlier to determine my release point of 3.0 feet, 1.5 feet in front of the foul line and highpoint downrange of 6.75 feet reached at 10.75 feet downrange.There was an added bonus by finding my release point. I was able to determine that my horseshoe rotates 580 degrees. I can now find two downrange points from this information. The location when my shoe is flat and open to the stake and the location when my shoe is flat and pointing away from the stake. So, in addition to the highpoint and downrange location, I can also place a marker before and after the highpoint location when the center of gravity offers a flat shoe in flight. This is important when throwing a flipping shoe. Since I am trying to pass the center of gravity through the appropriate points, a flipping shoe could occupy 7+ inches as it rotates in space. A turning shoe does not have this problem. I am hoping to create an animated GIF of the flight of my shoe as it rotates toward the stake. There were many formulae found to produce results regarding distance when trajectory is known, but, nothing that talked about calculations that provided results when you knew the distance, height and release point. I have written a Perl program that calculates the XY plot of a horseshoe in flight when the release point and highest point of flight is known. 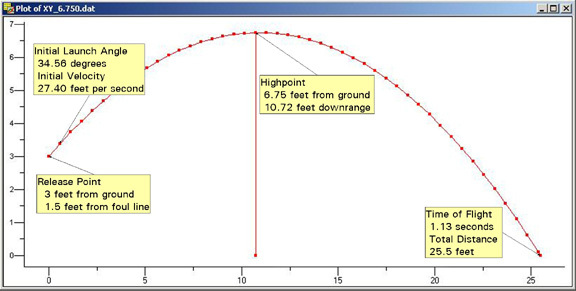 In addition, it calculates the initial launch speed, time of flight, initial launch angle and location of the highpoint downrange. Each point on the plot is in 1/40th of a second increments. 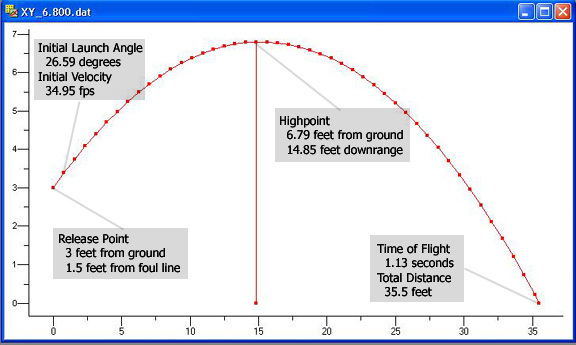 I decided to calculate the shoe flight from 30 and 40 feet. I later calculated the same plots at 1/100th of a second increments. The PDF file below extracts the information from each plot and places the results in table form for a distance of 25.5 feet (Elders pitching from 30 feet with a foul line at 27 feet). My release point is actually 1.5 feet ahead of the 27 foot foul line. Below is the plot of my shoe flight in 1/100th of a second increments. Double-click image for larger view. The number of plot points is equal to the time of flight X 100. My shoe flight plot contains 113 plot points. The plot below shows the rotation of my shoe in flight. My shoe starts out 40 degrees below horizontal. It rotates 580 degrees total, i.e., 1-1/2 flips plus 40 degrees. I could now place markers downrange where the shoe is flat in flight. If you wanted to be adventurous you could place a post, rod or PVC pipe, etc. at the point where the shoe is perfectly open downward and vertical. That point is 5.57 feet downrange and 5.9 feet up. 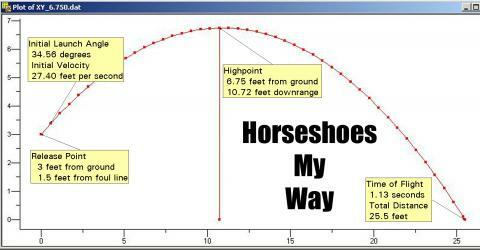 The flat shoe is just before the highpoint downrange and is located at 9.4 feet downrange and 6.7 feet up. Placing a string would best be placed where the shoe is horizontal open or closed. The shoe is flat in three places. The first at 1.7 feet downrange and 4.1 feet up. The second mentioned above and the third after the highpoint downrange. Placing more than one marker is more accurate than simply placing a string at the highpoint. The plot below is in 1/323rd second increments. I couldn’t resist. I’ve animated the image below. Put the cursor in the image below and mouse click. The animated flight of my horseshoe is shown (it loops 4 times and stops). I will be providing a table and plot for 40 foot pitchers at this point later.